A Russian SU-24 jet makes a close-range, low altitude pass near the USS Donald Cook on 12 in the Baltic Sea. One morning EARLIER tHIS month an American guided missile destroyer, the USS Donald Cook, set sail from Poland on a NATO exercise. It slowed down less than 50 miles from a Russian military base and began a series of maneuvers, including landings by Polish helicopters and the deployment of an antisubmarine device. 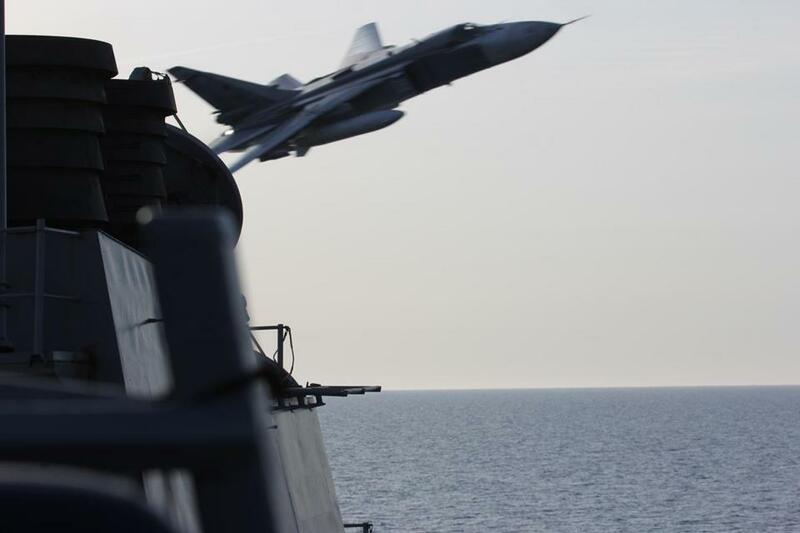 Alarmed Russian commanders responded by sending fighter jets to buzz the ship. They reportedly swooped to within 30 feet of the deck. Tension between Russia and the United States has suddenly become more intense than at any time in the last quarter-century. The two countries are fighting a virtual proxy war in Syria. In February they ceased cooperation over Afghanistan. Russia deployed ballistic missiles in Kaliningrad, its enclave between Poland and Lithuania; NATO responded by announcing a new anti-ballistic-missile program. President Obama, under intense pressure in Washington to show “toughness,” announced a quadrupling of annual spending for American forces in Eastern Europe, to $3.4 billion. Most ominously, both sides are modernizing their nuclear arsenals. This escalating confrontation is not in America’s interest. It prevents US-Russian cooperation on urgent issues ranging from nuclear security to the fight against the Islamic State. It also pushes Russia toward China. Instead of challenging Russia in its own neighborhood, we should seek a global relationship that serves our security needs. Our trouble with Russia may be traced in good measure to President Bill Clinton’s decision in 1993 to expand NATO into Eastern Europe. With the single exception of our decision to invade Iraq in 2003, this may now be seen as America’s worst foreign policy choice of the post-Cold War era. The division of Europe had barely ended when we helped divide it again. The decision to expand NATO was made haphazardly. Secretary of Defense Les Aspin opposed it. So did General John Shalikashvili, the Supreme Allied Commander in Europe. But Clinton was moved by appeals from Eastern European leaders, felt that he had to display leadership at a moment when his Bosnia policy was failing, wanted to please ethnic voting blocs at home, and was swayed by what one scholar has called “his own Wilsonian orientation toward spreading liberalism.” He never convened a top-level meeting to ask his advisers to present their views. The US took advantage of Russia’s weakness without imagining that it would one day become strong again or that NATO expansion would strengthen nationalist and neo-Communist groups in Russia. We assumed that Russia would happily accept our deployment of NATO forces in Baltic countries and welcome them to Georgia and Ukraine. The opposite happened. Russia saw NATO expansion as a threat and began intervening to secure its interests in nearby countries. Those interventions have provoked much outrage in Washington. They were modest, however, compared to American interventions in our Caribbean “backyard” over the last century — or to the ferocity with which we would certainly attack Mexico or Canada if they invited armies onto their soil that we considered hostile. Rather than feed the cycle of tension between Russia and the United States, we should step back from confrontation. The United States no longer needs to militarily dominate Europe. If European countries feel sufficiently threatened to want to maintain a military alliance, they should do so. As long as the United States continues to dominate NATO, however, we subsidize European countries that are unwilling to pay for their own defense and remove any incentive for them to seek accommodation with Russia — while preventing the improvement of US-Russian relations, which would strengthen our security. Last year, the United States and Russia worked together on a major diplomatic project, the nuclear deal with Iran. Returning to that kind of cooperation would benefit both countries, especially considering our shared sense of urgency on terror-related matters. Russia, which is merely a shadow of the US economically and militarily, does not benefit from long-term confrontation and could be open to a deal. We cannot expect the Russians to trust us, however, while we rattle our NATO sword on their borders and off their coasts. Russia will not help us in some areas while we confront it in others. When the United States decided to expand NATO, we believed Russia would smile gratefully while we pushed a stick in its eye. That was part of a larger delusion. Americans see our projection of power into other parts of the world as inherently benign and are shocked when others consider it hostile. The United States, like China, seems genuinely puzzled by the fact that it is often considered an aggressive bully. Most other countries realize that when they act against the interests of others, others may react against them, and that when they shoot at someone, he may shoot back. The United States reacted shortsightedly to the collapse of European Communism. NATO expansion, intended to promote stability, became a source of conflict. Europeans need a new security system, one that they themselves design, control, and finance. American military dominance in Europe no longer serves interests on either side of the Atlantic. It drains our treasury, diverts us from more urgent challenges, and pushes us into self-defeating conflict with Russia.